And that’s exactly the point where director Christopher Nolan plunges us into Dunkirk, a film that takes what is regarded as a military disaster and turns it into a cinematic triumph. This being Nolan, the storyline is far from linear: this time, he creates something that’s closer to impressionism, and which makes total sense on an intuitive level. Choosing three sets of people, all intimately involved in the action – a group of squaddies, some RAF pilots and a pleasure boat owner and his son – he re-creates the hours leading up to the evacuation, the eventual arrival of the flotilla and some of the aftermath. The outcome is a historical fact, but that makes no difference to the level of tension and pure fear in some of the scenes. The blazing sea, with soldiers struggling underneath the scorching waves, is truly terrifying. That’s just one of many. And there are more personal tragedies, like the young boy who’s determined to help out on the pleasure craft during the rescue. Much more than simply watching a film, this is a true cinematic experience, and a deafening one with the sounds of the bombs and machine gun fire ringing in your ears, just like it would have for the soldiers. To go with it, there’s a score from Hans Zimmer that isn’t actually musical, but made up of sounds and pulsating rhythms to match the mood and the action. The characters may not be fully rounded, especially the pivotal ones representing land, air and sea, but this isn’t a film driven by character. It’s about survival, about hope and about unconscious, often understated, bravery. All of the people we see on the screen are heroic in their own way, although none of them would recognise that as a description of themselves. 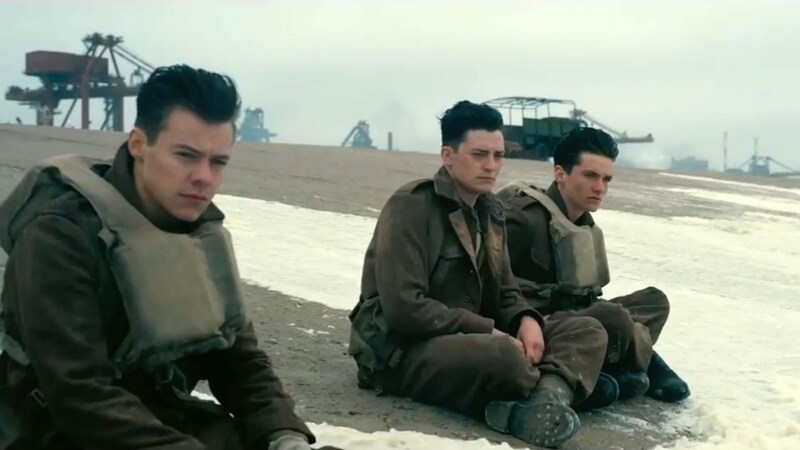 Sparse on dialogue – apparently the screenplay is only 76 pages long – and edited so that it’s as tight as a drum, Dunkirk is an exhausting, draining and emotional watch. Watching it in IMAX will resurrect even the slightest fear of heights or water, but see it in IMAX you should for the full immersive experience. If you can’t, a 75mm screening is the next best and, in truth, probably easier to find. But however, you see it, see it you must. This is film making of the very highest order, bringing all the elements together into one electrifying and deeply satisfying whole. And Nolan is the master. Stars: Fionn Whitehead, Damien Bonnard, Aneurin Barnard, Kenneth Branagh, Tom Hardy, Mark Rylance and Harry Styles. Dunkirk is out on the 21st of July.